Did 'Shrooms Send Santa And His Reindeer Flying? 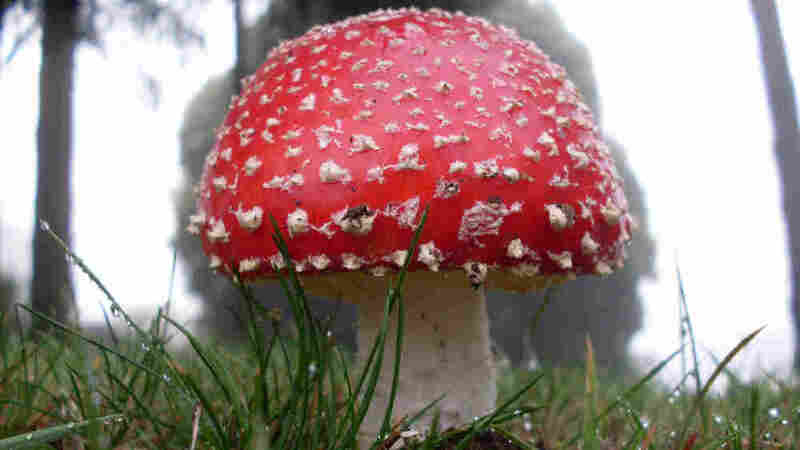 Long ago, shamans -- and reindeer -- in the Far East were known to eat red and white mushrooms. And then hallucinate. A Harvard biologist asks, is it possible this is the source of the "jolly" man in the red and white suit and his "flying" reindeer? Children across the land on Christmas Eve will nestle all snug in their beds to hear the classic poem "The Night Before Christmas." There's a parallel tradition on the Harvard campus at this time of year. Students and faculty gather to hear the story of Santa Claus and the psychedelic mushrooms. I stumbled upon this curious blend of biology and fable during a wintry campus visit to Harvard's Farlow Reference Library and Herbarium a few years ago. Curator and biology professor Donald Pfister greeted me in a majestic room, filled with glass display cases, folios and portraits. It's a short tour -- no time even to peek into the rooms that contain 1.5 million specimens of fungi, algae, lichens, mosses and liverworts. As we prepared to leave, we turned a corner, and there, in a glass case, was an odd assortment of artifacts: Christmas decorations shaped like red mushrooms with white flecks on them, Amanita muscaria, by name. There was also a Santa Claus, dressed in his traditional red robe with white trim. While I was puzzling at this display, Pfister turned to a colleague, Anne Pringle, and mentioned that he was planning to make his annual lecture about the link between Amanita muscaria -- which happens to be a hallucinogenic mushroom -- and Santa. Flying Reindeer, Or 'Flying' Reindeer? He explained that back in 1967 an amateur scholar named R. Gordon Wasson published a book arguing that Amanita muscaria was used in ancient ceremonies by shamans in the Far East. Other scholars then chimed in, noting that in Siberia, both the shamans -- and the reindeer -- were known to eat these mushrooms. Man and beast alike hallucinated. You can see the Christmas connections, Pfister said. "This idea [is] that reindeer go berserk because they're eating Amanita muscaria," Pfister said. "Reindeers flying -- are they flying, or are your senses telling you they're flying because you're hallucinating?" Look at the Christmas decorations here, he said. "We use -- all over the Western world at least -- these Christmas ornaments [which] have Amanita muscaria or other mushrooms." And finally, he said, consider the color schemes. "So here's a red fungus with white spots. And Santa Claus was dressed in red with white trim." Add it all up and what do you get? Pringle connected the dots: "People are flying. The mushroom turns into a happy personification named Santa." She said it with a laugh, but the connection between psychedelic mushrooms and the Santa story has gradually woven itself into popular culture, at least the popular culture of mycology, mushroom science. 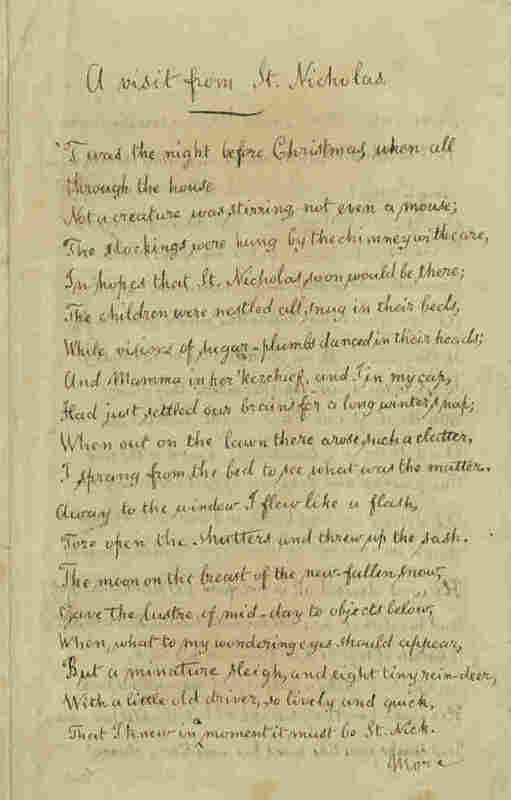 An 1860 copy of the Clement Clarke Moore's poem "A Visit from St. Nicholas," which begins: "'Twas the the night before Christmas, when all through the house / Not a creature was stirring, not even a mouse." Now some say that certain stories are simply too wondrous to question in this magical season. Others have no such compunction, like Ronald Hutton, a history professor at the University of Bristol. "If you look at the evidence of Siberian shamanism, which I've done," Hutton said, "you find that shamans didn't travel by sleigh, didn't usually deal with reindeer spirits, very rarely took the mushrooms to get trances, didn't have red and white clothes." And they didn't even run around handing out gifts. "The Santa Claus we know and love was invented by a New Yorker, it really is true," Hutton said. "It was the work of Clement Clarke Moore, in New York City in 1822, who suddenly turned a medieval saint into a flying, reindeer-driving spirit of the Northern midwinter." 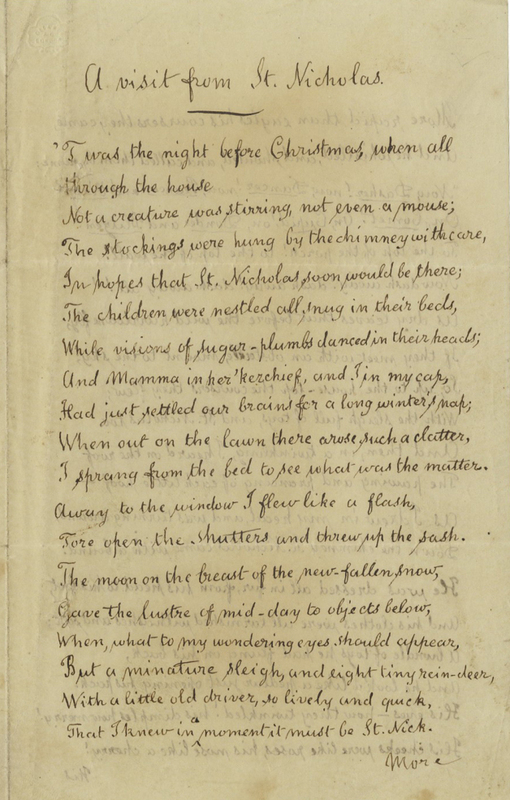 And Moore brought that beloved Santa Claus to life in his poem, "A Visit from St. Nicholas," otherwise known as "The Night Before Christmas."